I have been outed by another member of FT as to the motivation of my diet exercise regime. The reason for this is to raise money for DREAMFLIGHT. Our very own Dolly Dripmat also raised money for them every year and I hope between us we can raise enough to help some kids out. I will be doing the London Triathlon (1500m Swim, 40KM Bike ride and 10k run) on August 2nd. This itself is a challenge for a lot of people. It is a bit harder for me as I have about 9 years worth of beer hanging off the front of me. Since deciding to take this challenge to raise money for such a good charity dear to a lot of people’s hearts I have cut down (not out) the drinking and taken up a weird thing called exercise and dropped 20lbs and have a lot more to do. Please give as much as you can afford to this charity if you think they do a good thing. If you don’t know about them then take a look at their site. They make a BIG difference to the lives of seriously ill and disabled children and need all the help they can get from us. It takes around £3000 per child and they take 196 kids each year. I hope to be able to raise enough to pay for half a child. If your also in London on August 2nd then you can make sure I finish by being 5 paces in front of me with a cold beer in your hand as I will not stop until I can get it. - great cause, and good luck! Does this mean we can't look forward to PUTI classics between now and August? Sure, once I have got my MANKINI (nope it isn't me. ow my eyes! Oh, that's going to give me nightmares. A day-glo green mankini? For the love of God, why? Back on topic. Good luck in your efforts for this worthy cause. CT-UK - very best of luck with this. I'll be doing the second day of the Pan-Mass Challenge on the 2nd, so I'll be thinking of you! Let me know if you want any help with preparing for the bike! I'll sort a donation between now and then. Is this the end of "Bugger I am drunk" threads? Keep us informed with how things are going. Good luck! You are doing a wonderful thing. For inspiration, watch "Run, Fat Boy, Run". So is the picture on the page now a good likeness to you, CT-UK? No the pic isn't like me. 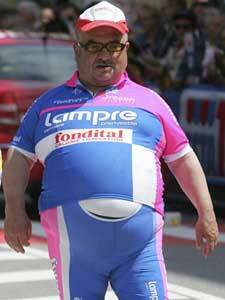 I haven't got around to putting up the pic of me in my new lycra yet.